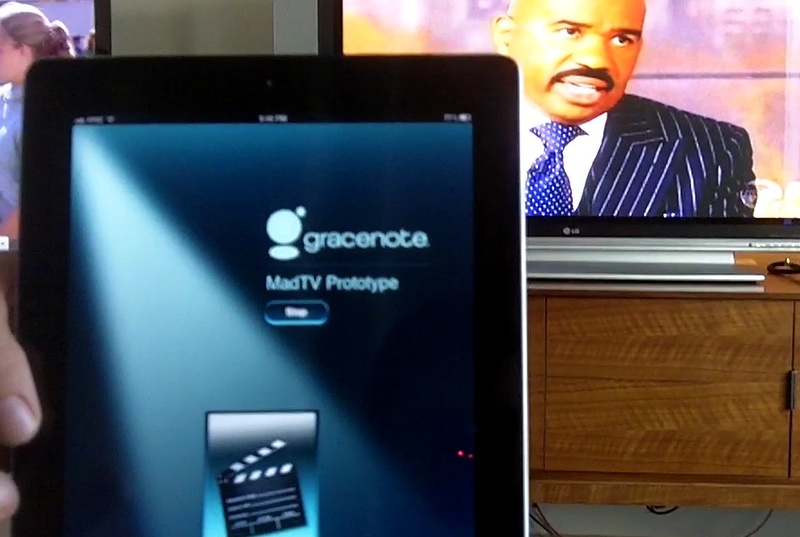 Gracenote is about to introduce its very own second-screen content recognition platform at CES. The company, which became a wholly owned subsidiary of Sony (s SNE) three years ago, aims to compete with similar solutions from Yahoo’s (s YHOO) IntoNow and social check-in services like Miso and GetGlue. Gracenote’s service is comparable to IntoNow in that it uses a tablet’s microphone to listen to the audio track of what’s playing on TV. It then checks the resulting fingerprint against a growing database of video content to deliver information to the tablet — a process that takes five seconds or less, according to White. He told me Gracenote’s service will eventually be able to deliver rich scene-level metadata for tens of thousands of movies, going as far as offering links to buy any of the products shown on-screen. Information for hundreds of movies will be available when the service launches in earnest next March. Contextual information for live TV isn’t quite as deep, but Gracenote uses its partnership with Tribune Media Services to cross-reference TV Guide data with what a user is currently watching. Gracenote wants to offer its advanced content recognition platform to CE manufacturers, broadcasters and developers of second screen apps, White explained. This is technically not the first time the company has been powering this kind of second-screen experiences: Gracenote’s subsidiary Gravity Mobile built the technology behind the ABC (s DIS) second-screen apps that are powered by Nielsen. (s NLSN) However, those apps are based on watermarks incorporated into the shows ABC build its apps for, which obviously requires the cooperation of the broadcaster.